$100 Bidders Fee (Admits 2): Includes Bidder Credentials, Valet Parking, Preferred Seating, and Invitation to Charity Reception. Additional bidder guest passes $25 each. Additional reception guest passes $50 each. While it is not necessary to pre-register, we strongly recommend that you do so in order to expedite the bidding process and enhance your auction experience. Photo (i.e. 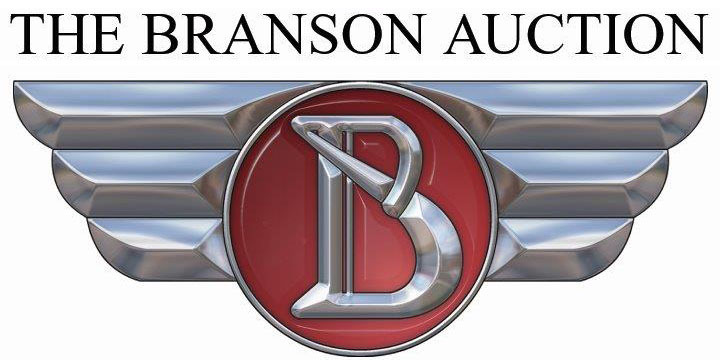 passport or drivers license photo) emailed to dmartin@bransonauction.com. Bidder Registration is located on the first floor of the Branson Con vention Center in the glass atrium. The most convenient entrance is the Sycamore entrance underneath the SKYWALK across from the parking garage. Valet parking available at this entrance. The auction site can be pretty hectic, and a fair share of bidders wait to register upon arrival at the site. This means there may be a long wait to be approved as a bidder. So, while you do not have to pre-register, doing so will enhance your auction experience. Phone bidding is available for vehicles only. Phone bidding is not available for purchasing toys, antiques or memorabilia. Lot # & specific description(s) of the item they wish to bid on. A bank letter of irrevocable guarantee, worded per the sample provided. Wire transfers will be considered with proper credentials. Completed and signed bidder registration forms. bidder to provide payment information. If the bidder has any questions or requires any further assistance, please contact Collector Cars International.